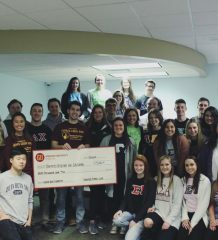 Gannon University participated in the annual Relay for Life Saturday, reaching its goal to donate more than $15,000 to the American Cancer Society. 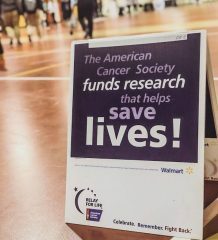 Relay for Life took place at Gannon’s Recreation and Wellness Center, where many teams joined together from noon until 10 p.m. to raise money to support cancer research. A registration table was set up at the entrance alongside of the T-shirt and Luminaria sale. The event utilized the center’s three main basketball courts. Supporting teams were set up at different tables along the borders of the court so when teams walked by, they would stop and donate to the cause. Tables were set up for various purposes. The event saw donations from pie faces, snacks sales, jail break, video games, lollipops sales, raffles and many creative ways to raise money. As promised, a large number of Greek Life teams were present. The relay schedule played out as planned and included fun activities besides walking and tabling like treasure chest decorations, colorful sand bottles, Hungry Hungry Hippos game, super hero runway and musical performances. Runners were provided with free refreshments and a device that counted each team’s steps. All throughout the event, motivating music played to keep people going and walking as much as they could. Many participants brought family members who have been affected by cancer to experience the event and be part of it. During the event, many expressed their motivation to participate and reason to support this cause. Lily Zheng, a freshman pre-optometry major, was part of Gannon’s Honors Program team. Zheng said that even though cancer hasn’t affected her life directly, it has affected others in her community. “I volunteered at Relay for Life because I think it’s such a powerful way to fight back against cancer, as well as to celebrate cancer survivors,” Zheng said. Mary Lohitai, a junior public service and global affairs major, relayed alongside her Alpha Sigma Tau sisters. Lohitai represented AST, participated in the step challenge and said she walked for about an hour and visited other tables to support the effort. “I wanted to do it because cancer affects everyone,” Lohitai said. 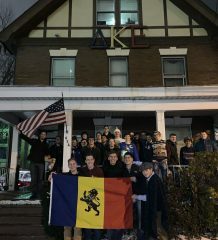 Nathan Manion, a freshman political science major, relayed along his new Delta Kappa Epsilon brothers. Manion said that his decision to participate Saturday was due to personal experiences his family has gone through. “I chose to volunteer for Relay for Life because my dad has been diagnosed with cancer multiple times, so being able to raise money for cancer is something that is close to my heart,” he said. His team decided to raise money by donating money to throw pie at other brothers’ faces. 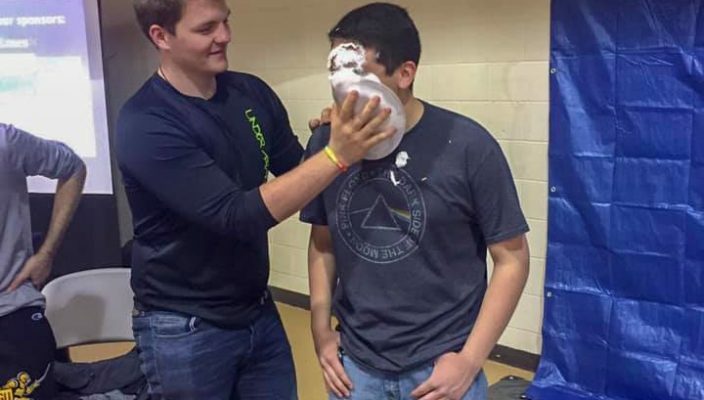 “Getting pie thrown in my face was interesting because I have never experienced something like that before, but I was happy to help because it is for a good cause,” he said.